1. Reflect on last year’s answer and describe, in retrospect, the outlook for 2017? It feels like 2017 will be a good year. The election of a new pro-business president has seemed to jump-start the economy and we are seeing signs that many projects that have been put on hold are resurfacing again. If the oil and gas industry comes back strong, it will be great for the insulation industry as a whole. Also, if regulations on the power industry are relaxed, that could be big for our industry as well. In 2016, the industry experienced some large swings in geographic regions with some markets up and some significantly down, but overall the market experienced a small increase over 2015. In 2017, I believe we will see an uptick in the industrial and power markets with a large increase in new gas-fired power plants replacing the coal-fired plant closures in 2015 and 2016. We may also see a 30% increase in the oil and gas sector if the price of oil continues to inch up. Commercial insulation work is at a peak in most of the major cities in the United States. I would expect moderate growth in both the commercial and industrial markets in 2017. As a result of low oil prices and a decline in drilling in 2016, many projects last year were delayed; we expect some of those projects to proceed in 2017. I believe that 2016 happened just about as we expected. There is consistent work throughout the country. We had budgeted for a slight decrease in our work load for 2017. Current conditions through the first half of February have shown us an increase in bid requests, so we may have to adjust our work load up a bit. When I look at last year’s remarks they look like something I would write for 2017 as well. The story is pretty similar, just the dates have changed to reflect slower than expected start dates. I think in many respects 2016 was very similar to 2015. There was a marginal level of growth but not enough to realize any relief from the highly competitive nature of the business. Market size and share concerns, coupled with backlog considerations, continue to influence and emphasize the deployment of short-term sales tactics versus longer-term strategic concepts. With the continued weakness in crude oil prices, there appears to be a more lax approach to enforcing the new energy code requirements for envelope and process flow assemblies. It is also fair to suggest the presidential election campaign impacted the performance of many market segments as no one knew for sure which outcome would prevail. Now that it is over, there are still many questions and concerns as the political status quo has been shaken to its core. We have yet to realize the impact, even though initial responses from the market suggest optimism with the potential reductions in regulations being one of the main priorities of the new administration. The outlook for 2017 will be as good or slightly better than last year. I believe that we all can make or break our year by adapting to our markets knowing that despite the current economic conditions, we will find innovative ways to assist our customers in growing their bottom lines. I think the outlook for 2017 is very positive. We have observed a lot of companies and manufacturers starting to invest resources back into expansion projects. We are also seeing an influx of new school and school remodel work scheduled for 2017. 2. What do you see as the top 3 challenges for 2017? For union markets, the introduction of non-union competitors is the biggest challenge. The International Association of Heat and Frost Insulators and Allied Workers and contractors must look at these challenges and think outside the box. We must take some type of bold action or union contracting will fade away in those markets like they have in others throughout the country. Union or non-union, a skilled workforce is a challenge. We need to figure out a way to draw younger folks into our industry. For our fourth-generation company, the next challenge is how to transition to the next generation and what will draw them into this business. Major challenges will continue to be the training of replacements for our retiring work force: Supervisors, Estimators, and Project Managers. We are all also experiencing a shortage of craft workers and our challenge will be how to get the youth of today interested in our great industry! One of the key challenges for the future for all of us will be the development and implementation of leadership training and development programs within our companies and the industry. Due to the recession in the middle of this decade, a high number of construction jobs were eliminated and many of these people did not re-enter the construction workforce. Additionally, we are experiencing a steady exodus of Baby Boomers from the workforce. Both of these factors lead to a reduced workforce as well as a decline in technical expertise. This situation dovetails into generational differences in the workforce and how to hire, train, and retain the younger generation. One of the challenges is trying to determine how the current legislature will move forward, if at all. The constant fighting among the parties cannot be good for our country. The question is, how will it affect the overall view of companies wanting to build in the United States? Another challenge will be how the market responds to higher interest rates. In November, after President Trump was elected, the market did not fall (for the first time in years) after there was a rise in the prime interest rate. That is a comforting occurrence, and hopefully the trend will continue. The third and probably biggest of the 3 is field labor, both quality and availability. There is a general consensus that skilled workers are retiring and the newer workers have not learned the same skill and drive of the more experienced workers. The problem is far bigger than any one company, so it will be the responsibility of the owners and contractors to come up with a solution to this problem. For 2017 the biggest issue I see is skilled labor. Demand is so strong for skilled labor that there are already shortages in certain areas of the country. I see no let up for the foreseeable future. There is also increased demand for professional staff and demand for quality Estimators and Project Managers remains strong. Of course, the election has taken center stage, and I don’t think anyone can predict where our government is headed and what the effect on our industry might be. Will the new administration create real growth in the economy and will it be possible for both sides of the aisle to rally around the topics that clearly represent an improvement in the living conditions for the middle class? Job creation from both the public and private sector is a critical component to the realization of sustained and substantial growth of our GDP. Our various media outlets and the White House must come to an understanding and hopefully realize that the public currently recognizes and disapproves of their adversarial relationship. Each side is wielding power without thoughtful consideration of the mid- to long-term effects of this chronic consternation. The left and right must find substantive common ground to pass effective and meaningful legislation. There is still a significant need and opportunity to work with members of the specifying and design community to assist them in the adaptation of the new performance standards that exist within the new energy and building codes. This learning curve must be conquered if we are to realize the benefits of what should be considered the new normal. If there is a significant increase in the demand for in-place construction, there will be an acute shortage of skilled labor to do the work, regardless of whether it is for infrastructure or building construction. This shortage will create inflationary pressure on wages and potentially limit the capacity of the industry to realize significant growth in the short and mid-term. The top challenges are finding the right people, controlling costs, and committing to effective leadership that will drive positive change. First would be obtaining enough qualified labor, second would be to hold back from getting more work than you can accomplish with the limited labor out there, and third is staying current with inflation as it starts to ramp up again. 3. What most excites you in the coming year? It has been incredibly rewarding to be the President of NIA over the past year. This year, I look forward to advising my friend, Darrel Bailey, as he steps up to take the position of NIA’s President. I am excited to become NIA’s President! What a great honor it will to be to lead the fantastic group of individuals that make up NIA. I am excited for the opportunity to give something back to this great industry that has made so many things possible for me and my family over the last 40 years! During an election year, it seems that there is little movement in business while waiting for the outcome; 2017 presents an opportunity to move forward as a country and an industry. The changes in DC—I don’t know if it’s going to be good or bad but it certainly is exciting. I hope that politics as usual is nothing of the sort. It is time to shake the tree and rattle the cage of the political elite and various media outlets in order to effectively do the business of the people. We need to build a newer and more robust economy that expands opportunity—in particular within the inner core of our largest cities. This could include the redevelopment of many residential, commercial, and industrial buildings. The opportunity to be creative in an ever changing, fast-paced, and extremely competitive environment. The competitive market that exists today will force us to find ways to excel and bring value to our customer base. Training new employees with the new updated NCCER curriculum and the new National Commercial & Industrial Insulation Standards manual, also known as the Midwest Insulation Contractors Association (MICA) manual. 4. What types of design issues do you see that are caused by out-of-date specifications? What do you recommend when a job has outdated specifications? This is an age old problem. The problem I believe is centered on education of the specifiers. Education related to all aspects of mechanical insulation systems (materials, installation, maintenance, etc.) is basically nonexistent. Combined with the loss of an experienced knowledge base due to right-sizing, multitasking, attrition, and a host of other events, the need has never been greater to ensure that mechanical insulation systems are being utilized to achieve their full potential in heating and venting air conditioning systems, hot and cold water plumbing systems, energy efficiency, emission reduction, personnel protection, and other design objectives. This starts with the specifiers. In many cases, old specifications are simply cut and pasted into a new set of specifications. Many products have changed, new and better products may be available, installation methods may have been modified, etc. The specifiers must commit to implementing a continual mechanical insulation educational program. NIA is certainly the avenue to assist in that endeavor. During the bidding process, the mechanical insulation contractor is normally the first to recognize an old or outdated specification, which can put them in a difficult position. Do they tell those involved the specification is outdated, submit an alternate, wait until they secure the business, or just proceed to comply with the specification? The answer lies with education at the specifier level. The bigger question is how that can be accomplished in an unbiased way. We continually see outdated design specs. The way we usually handle these is to contact our customer, point out the issues, and try to guide them to better specs in the industry. If they are not interested and we continue in the bid process, our clarifications and exceptions just keep getting longer. We very seldom bid on a system we do not believe will work. There is a constant problem that has been an issue for as long as I’ve been in the business: specifications just don’t keep up with new technology, means, or methods. Outdated or misapplied specifications lead to all sorts of design issues, not to mention unnecessary warranty work. The question is, what do you recommend when a job has outdated specifications? We try and work with the engineering community, mechanical contractors, and owners to educate them on the shortcomings of their specifications—sometimes this is successful, and sometimes it is not. The easiest thing to do is to refer them to the manufacturer’s literature—since they make the products and create the warranties, contractors should be installing their products per their recommendations. The most obvious issue is the continued use of less effective methods and materials to reduce energy consumption within the building construction process, which ultimately affects life-cycle cost and building performance. Design issues are a result of code compliance and it is obvious we need improvement to the process of enacting these significant energy code changes. The government needs to improve their capability or the use of private/public services should be considered to expedite the conversion and compliance process. At times we can all be prisoners of our past. We need concentrated efforts to educate and change out-of-date, inefficient specifications. When we find jobs with these out-of-date specifications, the first priority is to realize the importance of bringing the specification up to date. If we do not do this, we will continue to suffer, as we are enabling the system and not being agents of change. Usually, our problem is space. Using out-of-date specifications can cause there to be insufficient space for insulation, causing issues. Contact the engineer and try to set up a meeting where you can educate their company on the new materials and procedures used in the insulation industry. Using the new MICA manual presentation will give contractors a great tool to take to the engineering community and get them up to speed. 5. Since there is no training on mechanical insulation in engineering schools, what expertise would you like to share with engineers? NIA is a great resource for engineers. In addition to a large member body of industry experts, NIA offers tools and training that would benefit the engineering community. 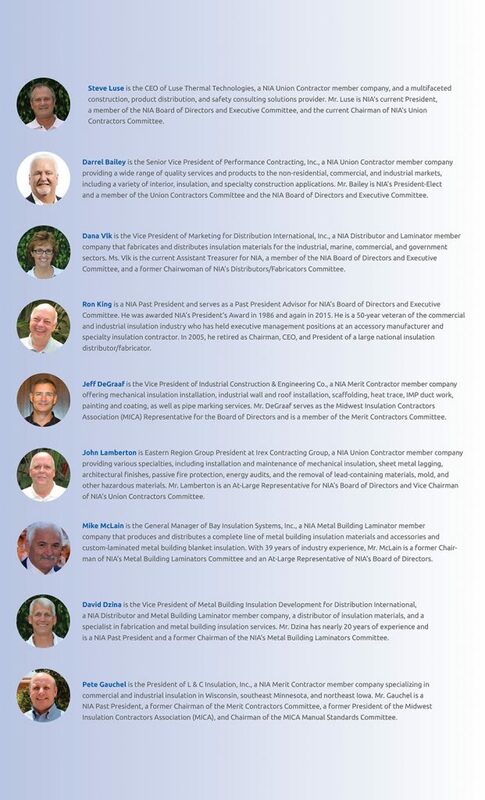 I am on the National Commercial & Industrial Insulation Standards manual technical committee (MICA manual). We are in the process of creating a presentation to be shown to engineers throughout the country. Hopefully this will help them get more informed. I would like to share my 35 years of headaches caused by dealing with these issues. I would like to share the need for training. If they don’t get the knowledge while in school, they really need to attend continuing education classes geared toward insulation. One problem has been the lack of available quality training and a willingness to attend what is available. Using the Mechanical Insulation Design Guide (MIDG) would be a good starting place. This living document addresses the common conditions and details that are associated with mechanical construction practices. It includes proper product or material selection and resources to ensure they are installed correctly. In the future it could include every code requirement and there could be a short list of proven solutions that would include the derivation process as it relates to identifying the right compliance path. The MICA standards manual. The MICA standards manual is the best thing in the insulation industry for engineers. MICA is unveiling a presentation that members can use to help educate the engineering community. 6. What is your advice to maintenance engineers to keep insulation performing at an optimal level? Is there anything you would like to make engineers aware of? Insulation should be considered an integral design component for efficiency, energy and cost savings, and prolonging longevity of equipment. Operating under a proper maintenance plan and considering insulation at the beginning of a project should be a priority. Implement a meaningful inspection program. Insulation systems, like all mechanical systems, require periodic inspection and maintenance. While inspection and maintenance are the responsibility of the owner, the fact is that most insulation systems are frequently ignored. With time, insulation systems can be damaged by a variety of circumstances; if they are not repaired or replaced, they can become ineffective. Insulation contractors can play a key role in facilitating regular inspection and maintenance programs. Failure to perform inspection and timely maintenance carries a number of risks. At a minimum, insulated areas should be inspected annually. Inspection of the external surface should include signs of cracking, distortion, damage, corrosion, evidence of hot spots on high-temperature systems, or condensation or ice build-up on low-temperature systems. There are risks associated with not maintaining a mechanical insulation system in a timely and effective manner. Those risks, and the severity of those risks, will vary depending upon the use/service temperature of the operating system on which the insulation is installed, the surrounding environment, ambient conditions, the extent of any damage to the insulation system, the insulation system design, quality of the installation, the time line of correcting any damage, and other occurrences that may be unique to the area in question. Mechanical insulation should not be installed and forgotten. Inspect and correct any damage in a timely and proper manner. Maintaining a proper insulation system is an extremely fast return on investment, just from the energy saved. When you consider the costs of a plant going down due to frozen or otherwise damaged pipes, there really is only an upside to maintaining insulation. Maintenance, maintenance, maintenance. Is there anything I would like to make engineers aware of? The energy loss and the cost of not maintaining their insulation. Energy appraisals are a huge eye opener when done correctly and presented properly. From a building envelope perspective, it is important to ensure the vapor barrier is not compromised and the envelope is free of condensation or moisture. If moisture is present, employ a method to dry it out and eliminate the cause of moisture. Survey your insulation systems on a biannual basis. You need to check your insulation systems regularly and repair them when needed to obtain a long insulation life for your facility. When you see water stains on insulation, take care of it immediately. Do not wait until the end of the cooling season. By then, your insulation system might not be salvageable. 7. What insulation project would you recommend to facility/plant owners and managers if they are willing to start with one? Invite a NIA Certified Insulation Energy Appraiser to conduct a study in their facility (there is a list of Certified Appraisers available at https://tinyurl.com/nzcozfb). The information gathered will alert owners and managers to measures they can take with mechanical insulation to enhance thermal performance and will also highlight the payback on the investment. I think many people would be surprised by the return on investment (ROI) from mechanical insulation. Implement a meaningful annual inspection program and maintenance program. The short and especially the long-term savings will exceed the annual expense. It will save energy, reduce emissions, help ensure personnel protection, improve processes, and help guard against the requirement for future capital expenses and expensive downtime. It is not complicated if you examine the advantages over time rather than considering mechanical insulation maintenance to be an annual expense—it is an investment with an attractive ROI. A simple first step is to replace damaged insulation on your steam system and insulate all valves and flanges. The ROI on this is a few months. Start with an insulation energy appraisal. The appraisal will show you where you will get the biggest bang for your buck. There isn’t a better way to prioritize. From my perspective it would be to conduct a complete energy analysis with respect to heating, cooling, and ventilation. This would consist of performing an infrared (IR) scan of the roof and wall envelopes to detect thermal bridging (IR thermography), and test for random air infiltration. The qualitative results of these tests can provide the responsible party with a series of options to upgrade the structure so that it performs at an optimal level with respect to energy efficiency and code compliance. The resulting work could be a simple repair or replacement of components of the structure or a complete redesign and installation of the envelope’s insulation (including penetrations) and replacing or upgrading the entire HVAC system. My recommendation would be to have a Certified Insulation Energy Appraiser come out to your facility and perform an energy audit. From there I would recommend starting with the smallest project and moving to the largest project. You will experience wins along the way in accomplishing energy efficiency at your facility or plant. The reason I would start on the small projects first is that they often end up causing the most trouble since they go unnoticed. Repair the damaged insulation systems in your plant—these are the most important projects. Most people put these repairs off for too long and then the insulation system has been destroyed. 8. What are a few of the strategic initiatives that mechanical insulation industry participants should be focused on to grow and improve their businesses as the industry evolves? Participate in the committee work within ASHRAE, ASTM, and the various code bodies to help craft the solutions that will meet future demands. Work with the specifying community and trades to ensure compliance with the new standards. Be involved on the front end of the process while driving the changes into the market. Be a leader! The first is we must have a training and certification program for the industry. It will bring more credibility and prevent poor installation from causing products to perform less efficiently. We need to get engineers educated on insulation because their schooling isn’t doing it. We also need to get the MICA manual in the hands of these engineers and get them to use it in their projects. 9. There is sometimes a disconnect between what insulation installers know to be best practices and what actually occurs on the job site—what advice would you give to engineers and PMs to ensure insulation is installed properly on site? Very simple—inspect what you expect. Implement a continual and meaningful inspection program and follow through on all problems that are identified to ensure they are corrected properly and in a timely manner. I would suggest you have your contractor submit insulation details/plates, showing you exactly how he or she plans to address each aspect of the insulation system. Then do daily or weekly inspections to make sure it is being done according to plan. Start by collecting references. Look at the experience of the company you have chosen. Do they have experience in that particular discipline? Demand that your contractor of choice has and abides by a comprehensive Quality Assurance Program (QAP). Unfortunately, there are a lot of companies that don’t even have a basic QAP. Get out on site and practice what you preach. One is not required to be involved with a government job in order to inspect the work as it is performed. On-the-job training is always effective so long as it is presented properly. We are all creatures of habit, which does not mean we are to be enslaved by them. Effective leadership is absolutely essential and must be backed up by the appropriate action. Answering the “W” questions (who, what, when, where, and most importantly, why) will go a long way in getting someone to consider and apply a different method. My mantra is to inform, involve, and inspire. First and foremost is to use the MICA manual plates in the submittal process. This puts the engineer and the mechanical insulation contractor on the same page before the first piece of insulation is installed. 10. What is the most important maintenance activity for those who are managing or supervising a building with insulated systems? Replace what you pull off. It is amazing to see how much insulation is removed during maintenance and never replaced. To learn and know how the system is to perform at its optimal level and ensure that conditions within the structure and the system are such to allow it to happen. Repair and replace anything that is out of balance with that initiative. How to identify damaged insulation in your facility and what it can do if it is not addressed in a timely fashion. 11. What impact do you think the new administration will have on the construction industry? If it is successful in its agenda of bringing back industry and jobs to America, rebuilding our infrastructure, and relieving the burden of excessive regulations on businesses, then it could be huge for the industry. I think it will have a positive impact. The markets seem to be reacting well and new projects are being approved. Infrastructure spending will likely foster growth in our industry. With a new President and federal administration change, it typically takes 6–12 months to understand the direction the new administration will be taking and the potential impact it may have on specific industry segments. Policies, practices, and programs that were implemented under the previous administration cannot easily be stopped in mid-stream. They must be wound down or modified to reflect the direction of the new administration. Depending on how you view the campaign promises or latest comments from the President or his cabinet, you could easily argue the new administration’s goals could have a positive impact on the mechanical insulation industry. If manufacturing in the United States is expanding, or they are modernizing their facilities, that could certainly create opportunities. If decreased regulations motivate businesses to invest in their business, that should also create opportunities. If corporate tax rates are reduced, past history indicates that should create opportunities. There are many similar examples, but we cannot forget there are many other factors that can influence the impact of these changes: interest rates, oil prices, terrorism, foreign conflicts, and consumer confidence, just to name a few. I think this question will be much more relevant in late 2017/early 2018. 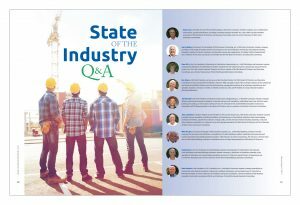 While there are many signs that the new administration should have a positive impact on our industry over time, there are just too many variables or unknowns at this time—combined with potential economy and global relationship questions—that I would hesitate to make any bolder predications at this point. During the campaign this administration promised it will be a friend to business. If that proves to be the case, and I do not see any reason why it should not, our industry will experience a tremendous amount of growth in the coming years. My hope is that any administration is pro-market and understands the role of the government in the marketplace—to promote an environment for businesses to have equal opportunity to compete, create level tax rates for all businesses, eliminate tax incentives for specific industries, and allow competition to expand, which always benefits the consumer by providing higher quality goods and competitive prices. If this administration and any that follow it will step up and do that, our economy and industry will thrive. My crystal ball is in the shop for repairs. It’s been giving me bad predictions and needs to be recalibrated. If the partisan gridlock loosens its grip on hate, fear, and regret, the agenda of the new administration will have an opportunity to make a difference. When this occurs, one will assume unnecessary regulations will have been lifted, meaningful tax reform will be in place, and health insurance will be addressed in a manner that provides reasonable and affordable care for all, delivered from the private sector. When this occurs, we may see growth the likes of which most in our nation will have never experienced in their entire lifetime. Perhaps we could we see a return to the ’50s and ’60s? I believe the Trump administration will have a positive effect on our industry. I see construction throughout our country increasing and because of the increase in activity, I also see wages going up due to the lack of skilled labor.